This weekend I revisited a project from my 1970s childhood. 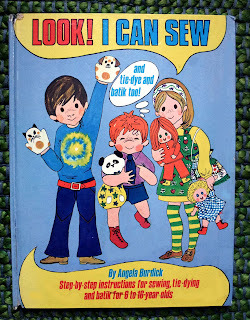 Ever since she found my dog-eared copy of Angela Burdick’s Look I Can Sew, my daughter has been begging me to help her do some tie-dye. Look I Can Sew is a 70s guide to sewing, batik and tie-dye for 6-16 year olds with wonderful bold and cheery illustrations. I’d done a few of the projects myself as a child and spent many hours poring over the pages of the book, so am delighted that it has the same strong appeal for her. 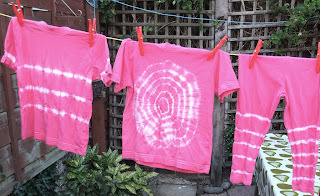 I was too chicken to let her loose on cold-water hand dyes so we started our tie-dye experiment with a single colour and used a Dylon washing machine dye (Flamingo Pink), which was easy to use and mess-free. 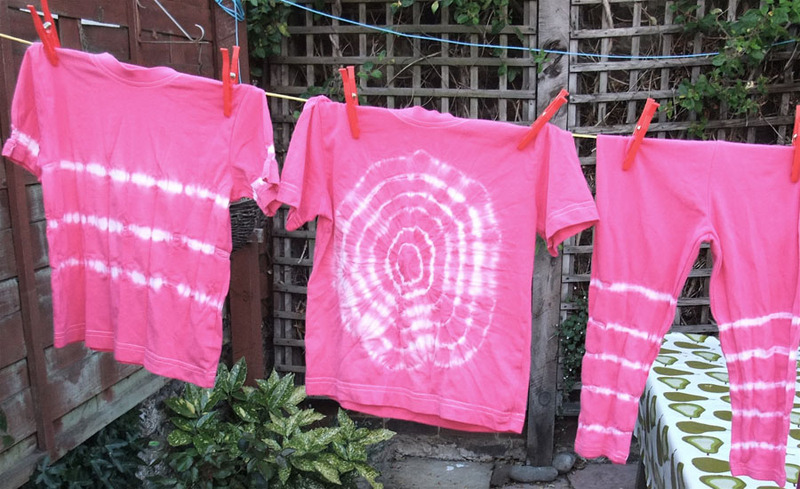 We think the results are great and next time I will be braver and we’ll try using cold-water dyes and do some colour mixing.